Almost a year ago at this time, the Captain was calling Montana “Siberia”….I am thinking that might still apply for 2018. Scott Arnold fished Georgetown last week and he and a buddy didn’t do very well on either the trout or the salmon, “We fished all day Thursday and most of Friday. The fishing was slow for us as we only caught a handful of trout and salmon”. Arnold went on to say that seemed to be the case for most of the fisherman he spoke with on the lake too! However Tracy Powers and Brandt Hamernick from Missoula sent me a great video of Hamernick catching and releasing a giant trout in their ice shack through the ice on Georgetown last Saturday. You can view the video on montanaoutdoor.com. I also spoke with Ed McClean from Missoula who has a cabin on Georgetown and he said Saturday morning the fish were smarter than he was that morning. “Fishing at Lake Mary Ronan at 43 feet of water lots of Kokanee Salmon. Fishermen wouldn’t give us exact numbers. 3”of slush under the snow. Ice is good but don’t take an ATV out there yet. 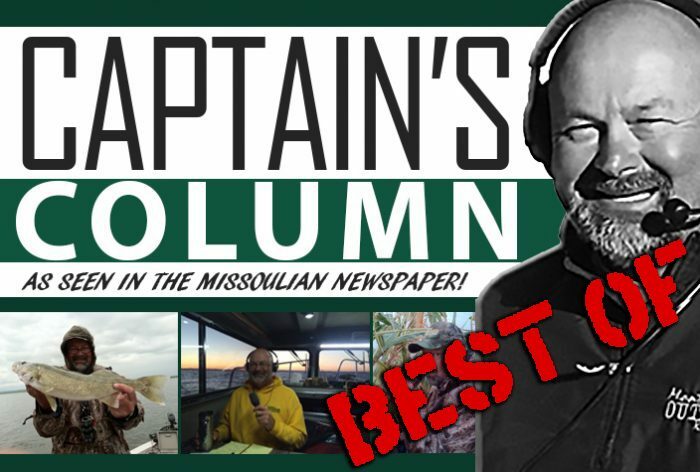 To read all of the reports from this time a year ago, check out the 2017 New Year’s Captain’s Column in this week’s BEST OF Captain Columns HERE!